Use the Explosives Flip Placard to drive legally. Our Explosives Flip Placard is loaded up with 9 different placards giving you the greatest flexibility in transporting your bang. 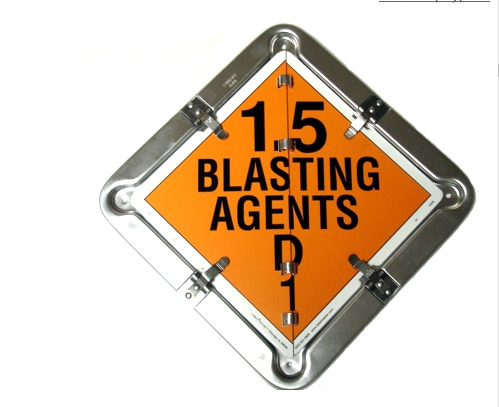 Flip signs included are Explosives 1.1D, 1.1B, 1.4D, 1.4B, Blasting Agent 1.5D, Oxidizer 5.1, Dangerous, Flammable and Blank. Signs are 10 inches by 10 inches meeting all the requirements of all the agencies that demand we placard our vehicles.